At Reliable Transmission Rebuilders Amesbury MA we can either provide or direct you to pretty much anything vehicle related you may need. Focusing on service is the number one priority. I will be more than happy to provide an overall assessment of your vehicle. Sometimes people need a little help when determining whether to repair or replace the vehicle. I can provide towing, diagnostics, outsourcing, fluid changes, electrical repairs, general repairs, transmission repairs, transmission rebuilds, differential repairs, transfer case repairs and much more. If desired, I will give you the option of installing a used unit to get your vehicle back on the road as economically as possible. We buy from salvage yards that purchase wrecks for their quality parts. We rarely buy from junk yards that purchase vehicles off the street. 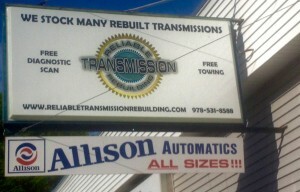 Stop by our shop that is the place that rebuilds transmissions everyday with our transmission specialists.